While I love sheds (and really any cute small building) there are some things I’ve figured about them that is about the practicality of using them. I’ll share that here. Size. They can be too small and I would suggest taping off the size of what you want on your driveway or garage floor and then fitting everything in there. You’ll find out if it can store all that you are thinking of (i.e. 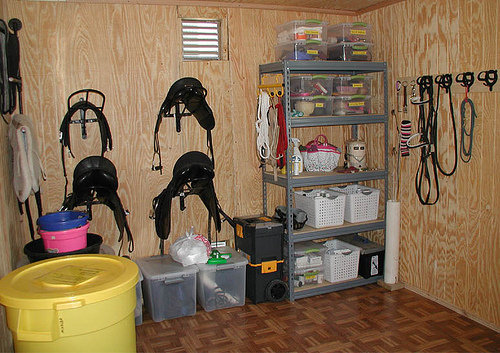 feed barrels, storage shelves, saddle racks, bridle racks etc…). I actually have an earlier post where I realized the size I was planning was too small. 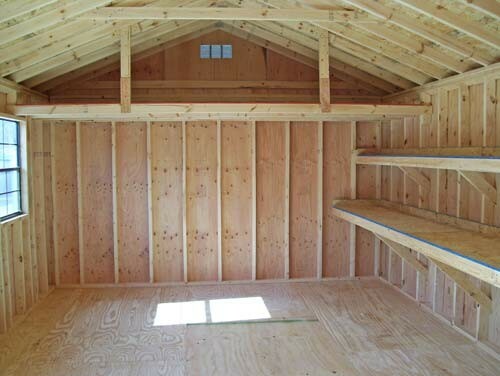 BTW if you board horses, and have more then a couple of boarders, a small shed will be too small. You’d be better off using a room in the barn. Foundation. I would defintitely plan on putting a gravel apron under and around the building with a slope outwards to encourage rain runoff – do you really want to encourage rot on your wooden building? My favorite idea is putting it on railroad ties embedded in gravel. BTW to find out about this you need to know your frostline and what the Extension office recommends for the amount of slope for your run off. Some of this may be determined by code and a lot of this can be found out searching the Internet for your local area. Insulation. Crucial especially if you will be spending a lot of time using this buidling or storing tack (which is vulnerable to hot and cold weather). We insulated one wall (the north) at one place and the difference was remarkable – the equine chiropractor told us he just needed a chair and some hot chocolate and he would be comfy even though the temp was under 20 and it had an open, southern exposure. I’ve sometimes seen the end lots of a few rolls of batting being sold on Craigslist. 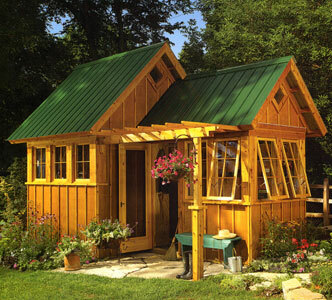 It doesn’t matter for your shed if they don’t all match so don’t get all OCD about it. Go for the savings. Roofing. I would plan on putting in some skylights if you don’t have any windows. I’ve commented to Oregon Sunshine about this but if doing a small roofing project, I would contact roofers and buy the ends of lots they have used for houses. Mix them up and apply for a gingerbread, cottage look. Another product to consider is Ondura which comes in sheets and may be easier to apply. Electricity. You need some sort of power as there is always a need to use something that plugs in. At the very least use solar panels. A floor heater can make a world of difference when it’s time to do chores and light during the winter evening hours is a Godsend. Windows. Most plans have way too many windows. It ups the cute factor and people go awwww! but it also means you lose that wall space. If you need more windows, get smaller ones and mount them high on the wall so you can put a shelf or bench underneath and still use the wall. Door. What side the door swing open and how you are going to keep it open with your arms full is a question you need to plan for. A door on the end gives more wall space then a door in the middle of the long wall; a door on the long wall can be wider and allow a larger porch and lofts in the end walls. Unless you are storing lawn equipment such as a riding lawn mower, a standard exterior door should be enough, though you do need a 4′ to get a wheelbarrow easily through. Be careful of plans with lots of doors as they also cut into your wall space. 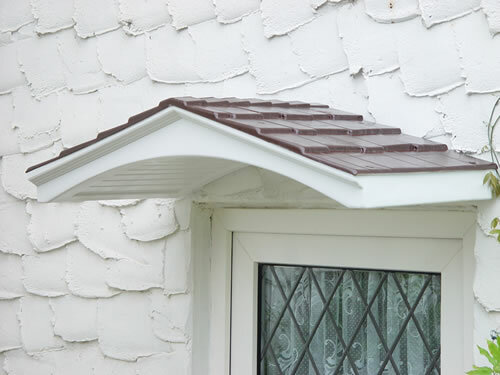 Another comment about the door, I would build some sort of awning or portico over the door in order to provide a bit of shelter from the rain when you are opening the door. It makes life a LOT nicer when you are doing chore time and frozen to the bone. Location. As a feed room you must be able to back your vehicle to the door so you can unload feed. This must be done without destroying your lawn and when the weather won’t be ideal (mud and snow). Feed tubs. I prefer large rubber garbage cans with lids. These are the type that mount on a dolley/wheels. This makes it easy to move them in and out when filling. Shelf units. I prefer the heavy duty metals ones with wood inserts that they sell at Lowes and Home Depot. These come apart to half size (half-tall) or can be completely dismantled. They are also strong enough to handle real weight on the shelves. Shelves store bins for wormer, first aid, hardware, and all the other crap we horse owners accumulate. Large bins and tack trunks. Storing of blankets, fly sheets, fly masks and stuff you might travel with for showing. Bridle hooks and saddle racks. Please don’t stack them 3 high so only a giant can get the top most saddle off. Tools such as mucking forks, shovels, wheelbarrow, rolling wagon etc… I would store in a lean too off the side of your shed. These are tools you access everyday and who wants to keep opening a door and dragging this stuff out to use it? Here’s the real scoop, while pre-built buildings save a lot of time they are way overpriced. I have priced out lumber for the same plan and it was 1/3 to 1/4 the price. If you have ANY DIY skills consider building your own before buying pre-made. This entry was posted in storage shed. Bookmark the permalink. I need to get you photos of my cottage. But, I think I’m basically going to be doing the something similar to what you talked about here with it. Ultimately, it needs to be a farm kitchen for making cheese and soap and a hiding place from my kids! There is no outside access to the loft right now. (Well, there IS… But it’s highly undesirable!) I don’t know if the 1/2 story loft will ultimately work to store hay, but I may try it next year, after I get the open end closed up. For this year, I think I’ll be storing my hay in the lower part of the cottage, and then deciding what to do from there.